The studios of the Brookline Interactive Group, BIG, filled with coders, artists, programmers and storytellers on Earth Day weekend for its first ever “eco hack” – an event that not only taught participants new skills, but that could make its way to the United Nations. The three-day event offered coders, artists and the like the opportunity to explore virtual reality, VR, augmented reality, AR, and 360 video, in a collaborative environment. Divided into teams, the participants were challenged to create a virtual experience that would educate users about the environment and climate change. According to BIG Executive Director Kathy Bisbee, VR, AR and 360 video are all the latest iterations of storytelling. BIG developed the idea for the eco hack after recognizing the need for creators to gain experience creating VR, AR and 360 video programs. “There’s a need for creators to have a space where they can collaborate with each other where they can learn new skills,” said Bisbee. Building Community is a year-long initiative to highlight aspects of the community that contribute to our sense of belonging, and foster new connections as a result. The hackers were given three days to work in teams to develop an idea and create the coding and design to bring it to life. The dedicated group of 32 members worked long hours. According to Bisbee the hackers worked as late as 1:00 a.m. one evening and promptly showed up the next day at 8:00 a.m. to resume work. Though exhausting, the experience was well worth it, according to hacker Stephanie Houten. A former BIG intern and a junior at Massachusetts College of Art and Design, Houten joined the event to learn more about VR. At the end of the event, Bisbee said that many of the hackers told her they learned not just new coding, design and storytelling skills, but that they also built their project management and communication skills. At the end of the event judges voted on the best VR and AR projects. The winner of the best AR program had viewers make decisions including whether or not to ride a bike, walk or drive a car in an effort to help users learn about their carbon footprint. With every good choice made in the program, the environment would become clear and sunny, but with every bad choice it would become smoggier and the sea levels would rise. The best VR project, which Houten worked on, played out in a similar way, by having users sort items in a room and determine what they could recycle and what they could compost. Another project allowed viewers to dive into the oceans depths to witness the bleaching of coral reefs. After learning about BIG’s plans for the eco hack, the United Nations contacted Bisbee to see if the hackers would be interesting in submitting their projects to the UN Environment Conference for use at the conference in Nairobi, Kenya in December. Bisbee and the hackers jumped at the chance. “It’s a really exciting opportunity,” she said. Though the hack is over, all participants have until May 8 to finish their projects before sending them to the UN. “It was really cool to hear that they were interested,” said Houten. A major goal of BIG, is to not only educate people about the latest forms of storytelling, but to make sure that all programs are available to everyone. “Our role as a media center is how do we make it more inclusive, how do we make sure people are trained?” said Bisbee. The range of ethnic and gender diversity represented in the ecohack participants was an encouraging surprise for Bisbee and the BIG team. According to Bisbee, of the 32 total participants, around half were women – an unusually high number. Houten said she believes that the level of diversity is not only what helped her team to win, but benefitted everyone involved by creating an inclusive atmosphere. “It really added something to our group,” Houten said. With technology still a mostly male-dominated field, VR and AR are attracting more women because they are more empathetic, intuitive and experienced-based, according to Bisbee. “It’s important to support all women of all ages, of all backgrounds,” said Bisbee. This is a trend Bisbee hopes to encourage through access not just to BIG’s resources, but also to mentors. 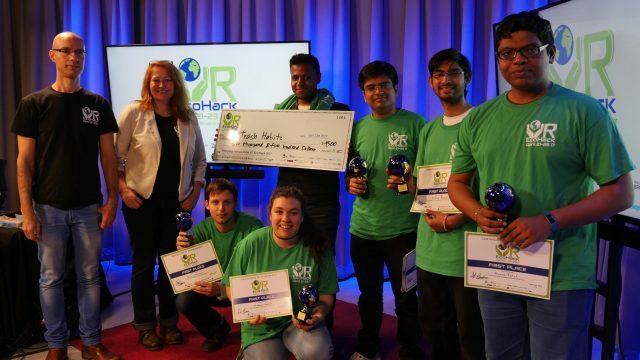 The ability to get hands on learning experience with VR and work alongside mentors is what made the eco hack a valuable experience for Houten. “They’re really awesome and they’re really generous with their resources and I think that’s why a lot of people were able to come,” Houten said of BIG. In addition to heading to the UN, Bisbee said that BIG had been invited to take the eco hack on the road across the country. While conversations are still ongoing, Bisbee said that BIG does plan to host the eco hack again next year around Earth Day week.